Bedford Town returned to winning ways in the best way possible on Tuesday night as they hammered Barton Rovers 6-0 in Southern League Division East. 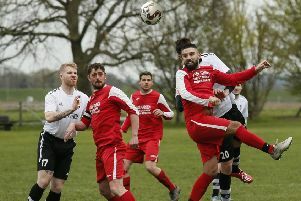 Strikes from Paul Benson, Devante Stanley, Bradley Woods-Garness, James Peters and a brace from Lee Roache gave Bedford’s goal difference a boost and a vital three points in the play-off chase. The game was fairly open to start with, although chances were at a premium. Bedford keeper Kyle Forster got down well to save Danny Talbot’s low shot early on, after Forster had created the scenario a few seconds earlier when he flapped at a cross and put the ball at the feet of the defender. Tommy Hull couldn’t get proper direction a few minutes later, as he stooped to head from a corner, his attempt going over the bar. The Eagles took the lead in the 26th minute when Benson reacted quickly to a free-kick from the left flank. He stuck his foot out to direct the ball goalwards beating keeper Matt Finlay. A few minutes later Barton could have equalised when ex-Eagle Andrew Phillips capitalised on a mistake by Devante Stanley. The right back made up for his error by racing back as Phillips went one-on-one with Forster. Stanley forced Phillips wide and Forster dived at his feet as the potential equaliser ended up in the hands of the Bedford guardian. Town then had a couple of chances after a David Manu shot was deflected off target. When the corner came over, Benson’s header was brilliantly palmed away from the top left corner by Finlay, who then had to get down to save from Steve Gentle. However, Bedford went 2-0 up in the 39th minute. An attack proved fruitless, and the ball came to James Peters, about 20 yards out. Without hesitation, Peters controlled and drove the ball through the area, finally seeing it nestle in the bottom right hand corner of the net. Three minutes later Bedford were firmly in the driving seat when Jimmy Hartley pushed the ball into the Barton area where Lee Roache was on hand and totally unmarked to pass the ball past Finlay. Five minutes into the second period, Manu’s cross from the right was headed goalwards by Benson, making Finlay stretch over to tip the ball over the bar. A minute later came a moment that made the home fans hold their breath, as Forster came out to clear a bouncing ball and completely miss his kick. The ball hit his hand and a free-kick was awarded to Barton, with the referee liaising with his assistant before deciding on a yellow card for the keeper. The game was well and truly won for the Eagles in the 56th minute when Roache – who hadn’t scored since the early portion of the season – bagged his brace with a header from a left-wing cross. A flurry of substitutions from both sides interrupted the flow of the game. Benson then saw a low shot saved and also produced a tame header that posed no problem for Forster. As the game entered the penultimate minute, Stanley was rewarded with a goal for his surging runs from defence throughout the game. From a free-kick played earlier, Stanley stayed upfield, and when Andre Olukanmi played a simple forward pass through, he was on hand to receive and slot the ball past Finlay. Bedford went one better two minutes into stoppage time, when a cross from the left of the area went to the far post, and from an impossibly tight angle, Woods-Garness rose high to head the ball over the line. Bedford host Moneyfields this Saturday.